The Chick-fil-A philosophy of customer service was the focus of a recent presentation for Samford Network in Birmingham. 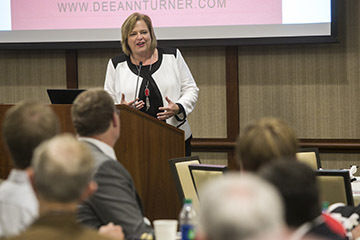 Dee Ann Turner, Chick-fil-A’s vice president of enterprise social responsibility and author of It’s My Pleasure, was the featured speaker. Birmingham area Chick-fil-A operators provided breakfast, and more than 160 area business people and students attended. Turner spoke about her experience at Chick-fil-A and the importance of fostering a strong corporate culture. Chick-fil-A founder Truett Cathy served as a mentor to Turner for many years, and she continues to pass on his wisdom. “We need to know exactly why we’re in business,” Turner said, as she told the story of how Cathy developed the company’s corporate purpose in 1982. Turner also discussed the value of being servant-minded. As an example, she told a story about Samford alumnus Mark Meadows, the owner of the Chick-fil-A at Inverness. When people were stranded on Highway 280 during the snowstorm of January 2014, Meadows distributed hundreds of chicken sandwiches to people who were unable to make it back home. While some businesses may have viewed the situation as an opportunity to make a large profit, Meadows used it as an opportunity to serve others. In It’s My Pleasure, Turner shares more details about why a healthy corporate culture is essential for a successful organization. Turner is the latest Chick-fil-A executive to speak at Samford. The Cathy family have many ties to Samford. Don “Bubba” Cathy is a 1975 graduate of Samford’s business school. Trudy Cathy White and her husband, John, who are involved with the Cathy family’s Winshape Foundation, are Samford graduates and parents of a Samford graduate. Dan Cathy, current CEO of Chick-fil-A, has been a frequent speaker on campus and is a father of former Samford students. Truett Cathy also was a frequent speaker and guest on campus. Rachel Sinclair is a journalism and mass communication major and a news and feature writer in the Division of Marketing and Communication.